The WVSRPA conducts fund raising throughout the year. Fundraising can be for specific programs or for general association operations. 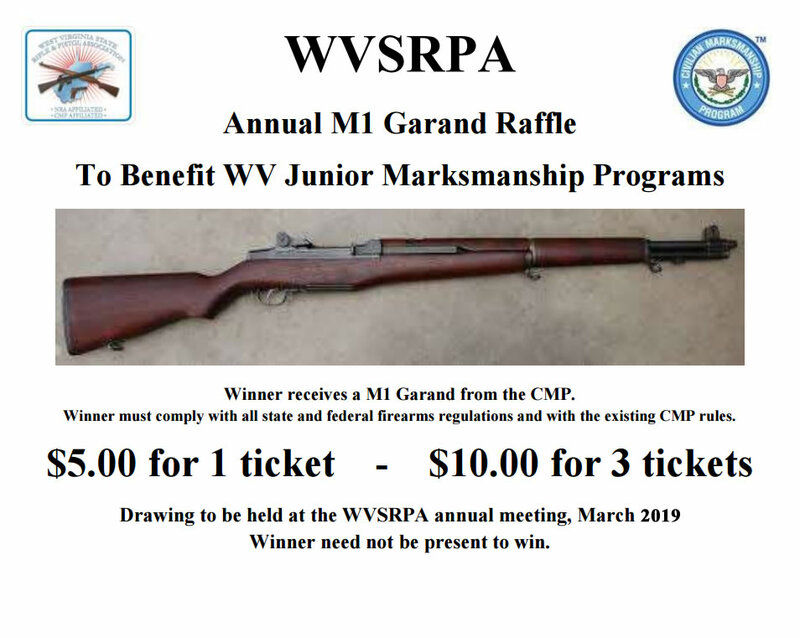 WVSRPA is conducting the 2019 Annual M1 Raffle for the sole Benefit of Junior Marksmanship Training. The raffle winner will receive a .30 Caliber M1 Garand Rifle provided by the Civilian Marksmanship Program. The winner need not be present to win but must comply with all state and federal firearms regulations and with the existing CMP rules applicable to sales of M1 rifles. These rules include membership in a CMP associated Club or State Association. If the winner is not a member of a CMP associated club or State Association, a one year membership to the WVSRPA will be provided at no cost. Tickets are $5.00 each or $10.00 for 3 tickets. Henry Golden Boy, Silver .22LR. The rifle was “one of a thousand” fired simultaneously on November 14, 2016, one week after the latest presidential election. Each rifle fired two rounds in the World Record Setting shoot held at Ben Avery Shooting Facility in Phoenix, Arizona. This rifle is number 673 of 1,000 and features an octagon barrel, American walnut stock and fully adjustable Marbles semi-Buckhorn sights. Proceeds from this raffle will go to the Association operating funds. Tickets are $5.00 each or $10.00 for 3 tickets.Drawings will be held at the WVSRPA Annual Meeting in March 2019. Contact a WVSRPA Officer or Board Member for tickets.